Midtown Nursery will fight against a new food truck concept planned for its site. Plans for the Truck Stop, a new hybrid restaurant and food truck court, will likely roll forward at Cooper and Central despite a swell of support for the corner's current tenant, Midtown Nursery, whose owners want to keep the business where it is. Midtown Nursery owner Mike Earnest said Monday he had a verbal agreement with Loeb Properties for a new lease at the site, where he's operated for the past five years. But when he returned from a trip out of town, he was told a new tenant had emerged with plans to develop the tiny triangle of land at 2120 Central and that he'd simply have to move. "I was upset because I did have a verbal agreement, and I thought that was good enough," Earnest said. "I figured a man's word was his word. Evidently it wasn't." Loeb Properties president Bob Loeb said the lease was up for renewal and that the nursery was "even considering other locations for their business." "It wasn't urgent to them to sign the renewal. In the meantime, we were presented with the Truck Stop concept, which we found really dynamic," Loeb said. "We have been in regular communication with the nursery and have expressed an interest in helping them find a new home." The new tenant, Memphis Truck Stop LLC, wants to use the space to launch a hybrid of a traditional restaurant and a space for food trucks to dock. The company wants to build a two-story structure for a small kitchen and indoor and outdoor seating. The Truck Stop will serve breakfast, lunch, and dinner and can operate as a stand-alone restaurant but will be specially equipped to be the temporary home for up to three food trucks, according to the project's application with the Shelby County Board of Adjustment. The Truck Stop's plan for the site will be reviewed by that board on Wednesday, November 20th, at Memphis City Hall. 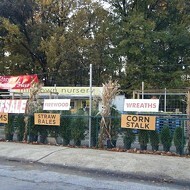 It's there that Midtown Nursery owner Earnest hopes to make a stand for his location with a petition he's been keeping at the nursery and a digital list online. Truck Stop owners Taylor Berger and Michael Tauer said they only began to hear negative feedback on their plans, mostly through social media, after their lease was signed. "As I was working through the negotiations, we thought they [Midtown Nursery] were on board with relocating," Tauer said. "This has been a surprise to us, and we're sad about it and wish them all the best." However, they said they're looking to the future and will continue to develop the Truck Stop. Decisions from the Board of Adjustment will likely only make them change some of their design plans. The board's chairman, Frank Colvett Jr., said he won't render a judgment on the plan until he sees the staff reports from the Memphis and Shelby County Division of Planning and Development. But, he said, the Truck Stop plan has much going for it. "The concept is unique, and that is the cool part about the Cooper-Young District, especially now with what they're doing down on Madison," Colvett said. "If you look at the layout of that piece of property and the way it's configured, there are a very limited number of uses [for it]." Tauer and Berger said they have already invested significant amounts of money in the project and will begin work at the site once the nursery's lease is up sometime around February or March. They expect to have the Truck Stop opened by summer 2014. Earnest said he'll fight on until the November 20th meeting but likely won't "have a leg to stand on" if the Truck Stop design is approved. After that, he said he'll reluctantly begin looking for a new location.